The lack of concern among what seems like a majority of the American people about the critical state of the national debt and spending deficits exceeding a trillion dollars a year is nothing short of stunning. This large group includes the federal officials we elected, expecting that they would run the government sensibly and according to the Constitution. Over several decades our elected officials have created a level of debt that now threatens America’s future, with little or no worry about what they were doing. It probably isn’t time to call 9-1-1 yet, but that moment is not far away and closing in on us. But, in the face of impending doom, the president and the Congress continue along the same destructive path, spending too much and spending irresponsibly, believing the Tooth Fairy’s promise that everything will be just fine if we raise taxes on the wealthiest Americans. Economist Dr. Thomas Sowell commented recently that “Most of us might be a little skittish about spending money if we were teetering on the brink of bankruptcy. But the beauty of politics is that it is all other people's money, including among those other people generations yet unborn.” Former British Prime Minister Margaret Thatcher informed us that the problem with liberalism is that before long you run out of other people’s money. Thus, when you put liberals in charge of Washington politics, you have the worst of both worlds. The Greek cynic Diogenes spent his life searching for “an honest man.” Nearly as rare, apparently, are elected leaders who truly grasp the seriousness of our economic situation and have the courage to do something about it. All one needs to do to predict our own future is to look to Diogenes’ homeland, where decades of living the socialist good-life created a populace that doesn’t understand that its government is about to collapse. Although collapse will leave them in far worse shape than if they just willingly give up some of their goodies, they will fight to the death to keep the joyride going. Greece is home to 11 million people and a government that gives them many perks in return for high income tax rates of 18 to 45 percent for everyone making more than about $16,000. Employers pay 28 percent of salary and employees pay 16 percent of salary for social security, and there’s a Value Added Tax of 23 percent. And, the high income-related taxes have produced wide-spread tax evasion, affecting revenue. One of every 11 Greeks works for the government in a cushy, non-demanding and often patronage-acquired job featuring bonuses for such things as showing up for work on time, using a computer, or for working out of doors. They get half a month’s extra salary at Easter and another half during the summer. Greeks also receive generous pensions that often kick in at age 45. The socialist government spent too much money; they took all they could get from the Greek people and then they started borrowing, and now that has run out, as well. The Ministry of Employment is trying to find effective ways to fight unemployment, which is expected to reach record levels this year, and 220,000 companies are predicted to go bankrupt. The government is trying to implement austere methods like slashing public spending, freezing or cutting public sector pay, raising taxes and raising the retirement age. But all the protesting citizens care about is having the free ride continue. 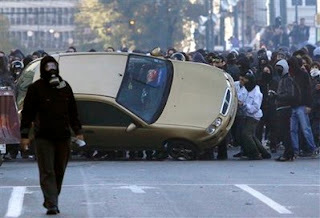 The “Occupy Whatever” movement now making the rounds of American cities resembles the protesting Greeks in attitude and behavior, another sign that we are headed down that same road. The Heritage Foundation’s Patrick Tyrrell presents data showing that one in five Americans now relies on the federal government for housing, health care, food stamps, college tuition and retirement assistance; more than 67.3 million Americans receive subsidies from Washington. The average individual who relies on Washington receives benefits valued at approximately $32,748, slightly more than the national average disposable personal income of $32,446. Individual assistance programs eat up 70 percent of the federal government's budget, a huge outlay that is supported by only half the population, the ones who pay taxes. Our public servants should take notice of the similarities to this Greek tragedy and ask themselves if a gargantuan, paternalistic government is such a great idea, why is Greece falling apart? But instead of seeing the error of their ways and making the tough decisions we elected them to make, and which are necessary to save the country from their malfeasance, they instead asked the Congressional Budget Office (CBO) to help identify a way forward that will allow them continue in their efforts to buy the votes of the dependent class by doling out taxpayer dollars to them. The CBO determined that by raising taxes on everyone, things will be just fine: Raise the lowest income tax bracket of 10 percent to 25 percent, the middle tax bracket of 25 percent to 66 percent and the 35 percent tax bracket to 92 percent, and, voila, problem solved. This is why Barack Obama and a large number of US Senators must be driven from office in November. and do you have the median amount available? I'll have to check my notes this evening after work and V-Day activities. I don't have a median figure. Actually, I had the info at hand.